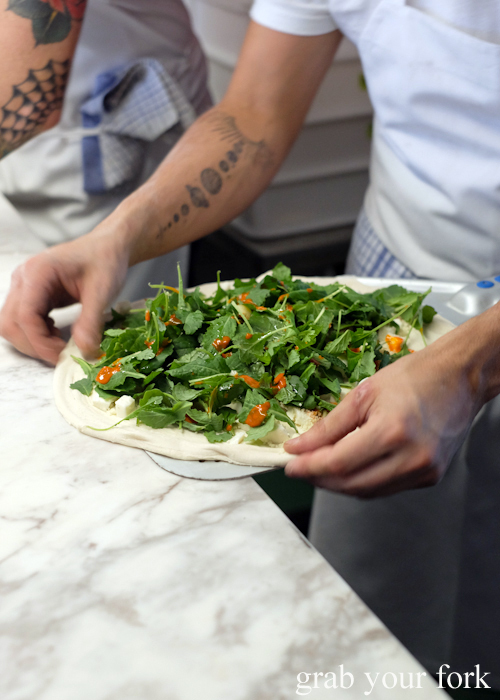 Is pizza the new sourdough? 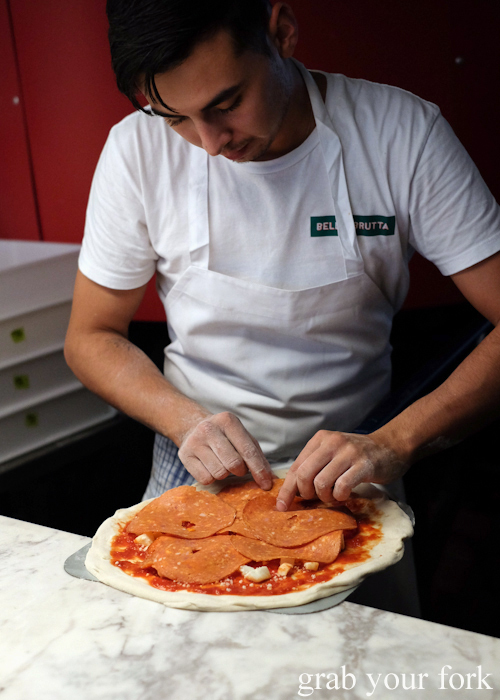 There's much to like about long fermented pizza doughs, proofed for extra flavour and a springier texture, the star of Sydney's hottest new pizzeria, Bella Brutta. Don't expect supreme or ham and pineapple pizzas. 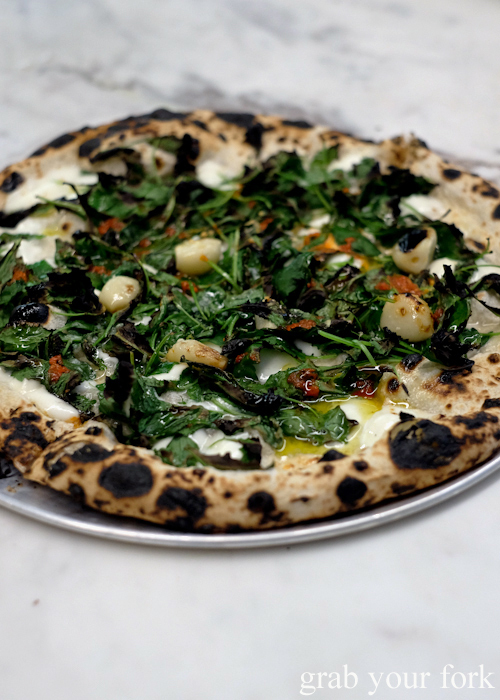 Do stand by for puffy and blistered pizzas strewn with mortadella or pepperoni (both housemade), surf clams or cavolo nero. 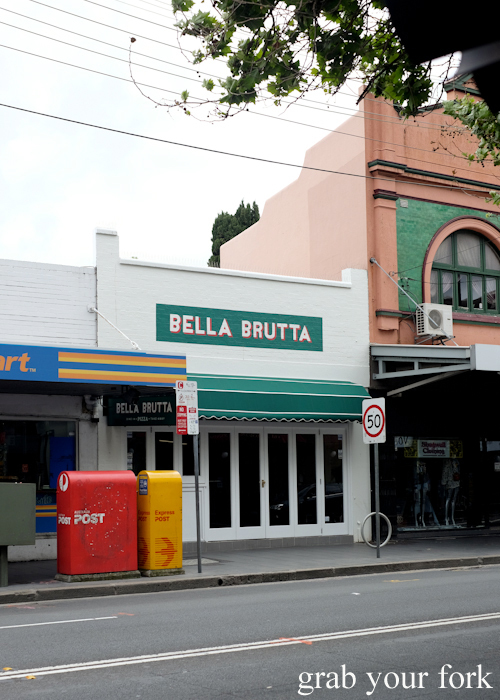 Bella Brutta (translating to Beautiful Ugly) is the latest collaboration by the Porteno crew, partnering with Luke Powell to open in the former Ice & Slice by Mad Pizza site on King Street, Newtown. The space is long and narrow, flanked by banquette seating on one side and counter seats at the bar on the other. 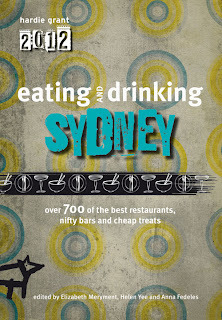 The wine list runs close to 40 bottles - almost entirely Australian and Italian - with ten available by the glass. 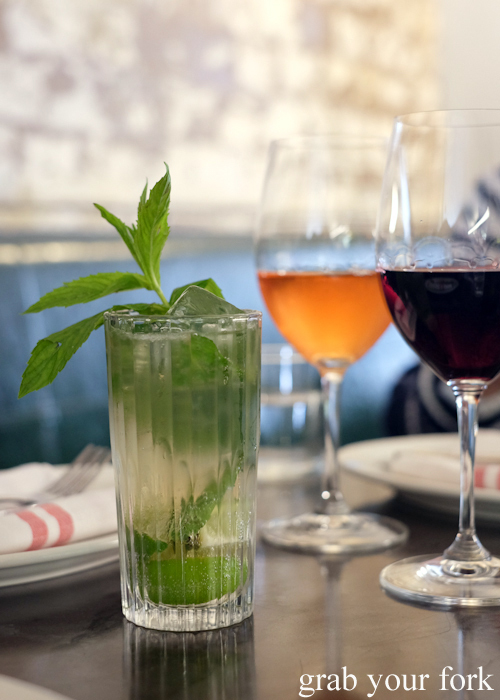 And while there's less of an emphasis on beer (just two available), interesting non-alcoholic drinks include a dark & stormy and a smoked lemonade mojito that is smouldering yet strangely refreshing at the same time. On the day we dined, all the antipasti and vegetable dishes are entirely vegetarian. 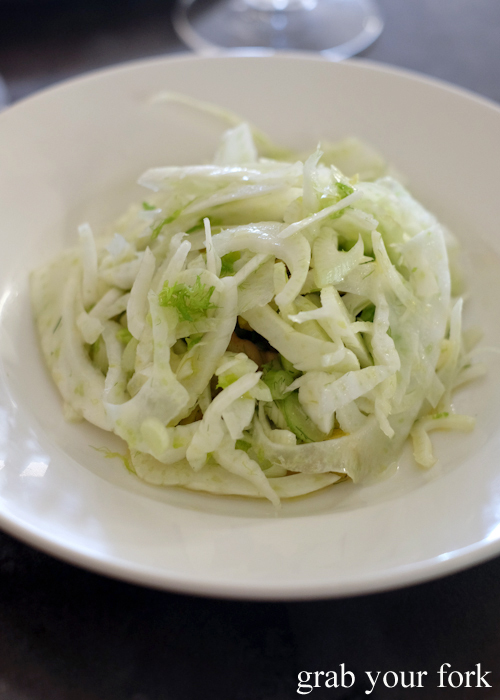 That's 11 dishes running from a crisp shaved fennel salad with oranges and green olives to roasted carrots with hazelnuts and marjoram ($12). 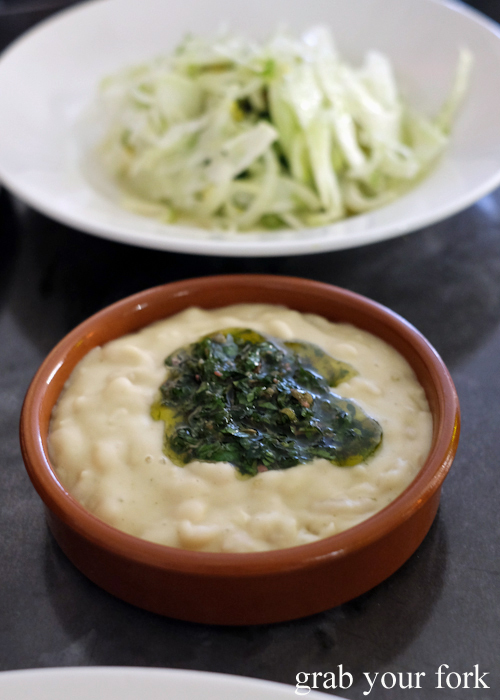 From the antipasti menu, we pick the white beans with green sauce, a chunky white bean puree brightened with the zinginess of salsa verde, although we're tempted by the green tomatoes with straciatella ($14) and charred onions with romesco ($14) too. Our attention is all on the pizza though. 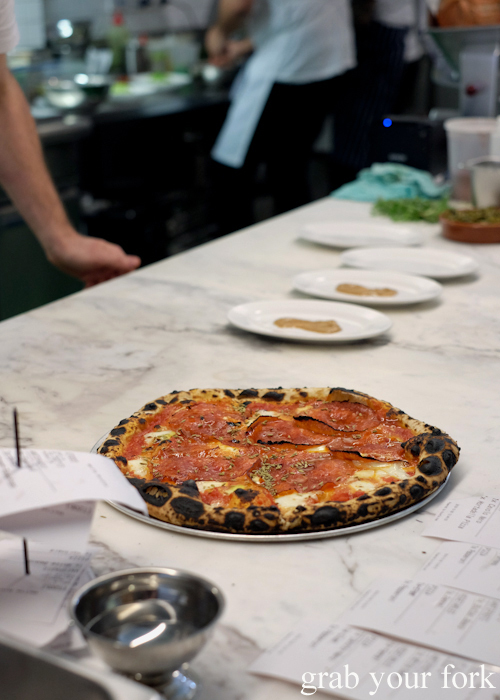 Just five pizzas are available, although the plain marinara ($17) comes with optional cheese (+$4) and four anchovy choices ranging from $12 to $28 for the tin. 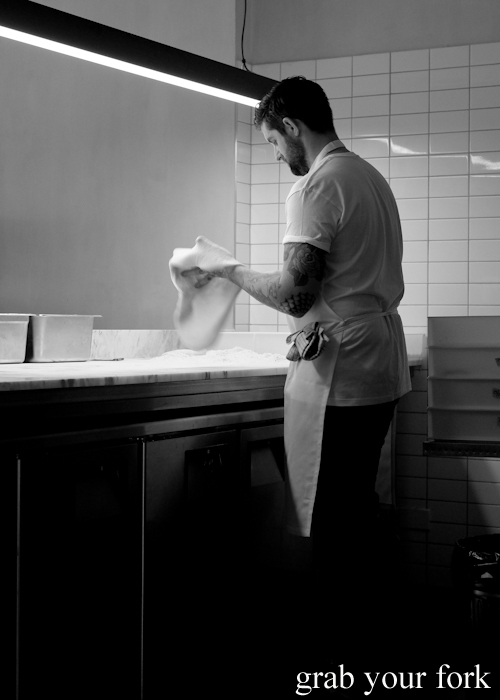 Luke moves seamlessly throughout the open kitchen working where needed, but more often than not, is at the pizza station. It's a show in itself watching the dough being gently portioned, dusted in flour and then slowly flipped, stretched and teased into pliable submission. The wood-fired oven - imported direct from Italy - takes pride of place in the centre of the dining room. 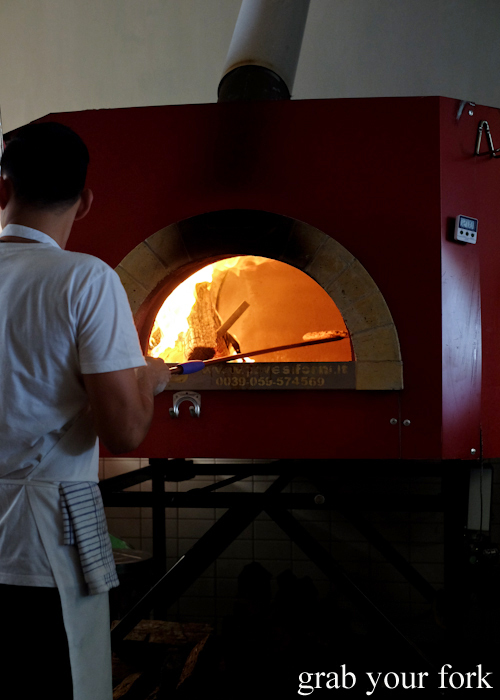 It's mesmerising to watch the wood burning ferociously in the back corner while the pizzas are rotated through at a rapid pace. They're cooked on the oven floor for only a minute or so before being lifted up by the paddle and held aloft for several seconds. 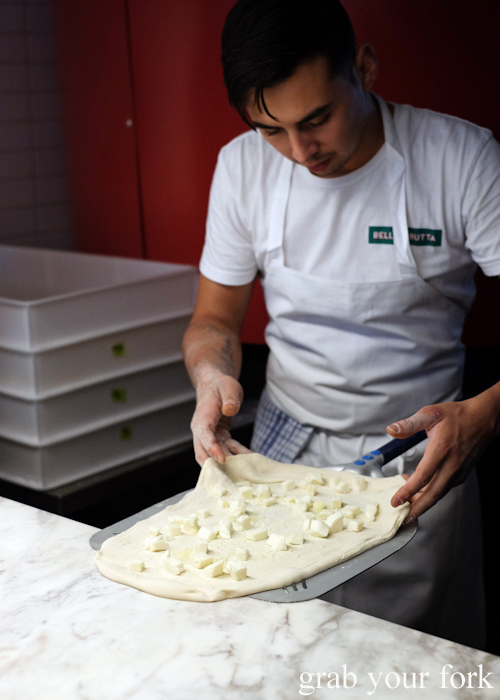 There's a ballet-like elegance about the entire process, from the initial cleaving of soft dough to the final slide of steaming hot pizza onto the pass. We've serendipitously scored front row seats to all the pizza-making action. This also makes for sneaky photos of our pizza orders from start to finish. As soon as the pizzas are transferred to their metal serving trays, they're sliced into quarters and finished with garnishes and a slosh of extra virgin olive oil. 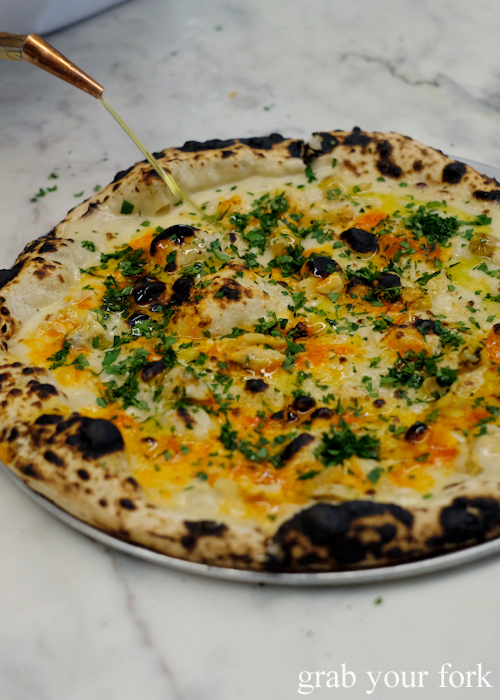 Clam pizza might be a New Haven specialty but it's yet to be really seen in Sydney. 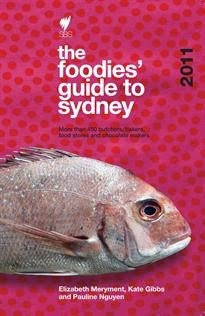 Luke's take could become a summer favourite, brushed with a chowder-like clam reduction and daubed with fermented chilli. 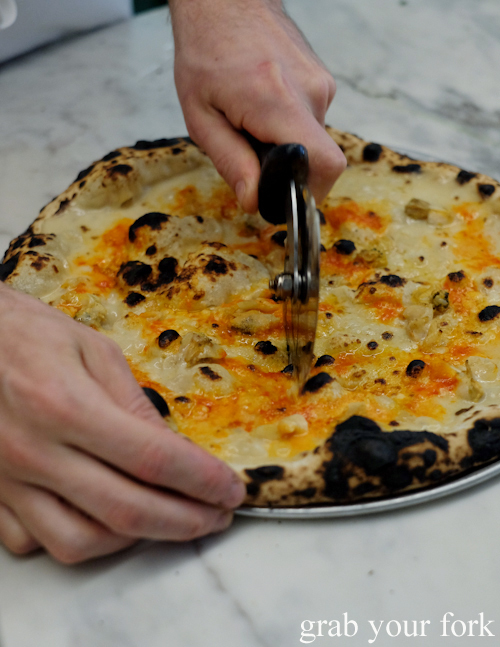 Pecorino, garlic oil and fresh parsley make it sing. We pick the pepperoni pizza over the mortadella (the latter covered in freshly shaved mortadella after the pizza is cooked). 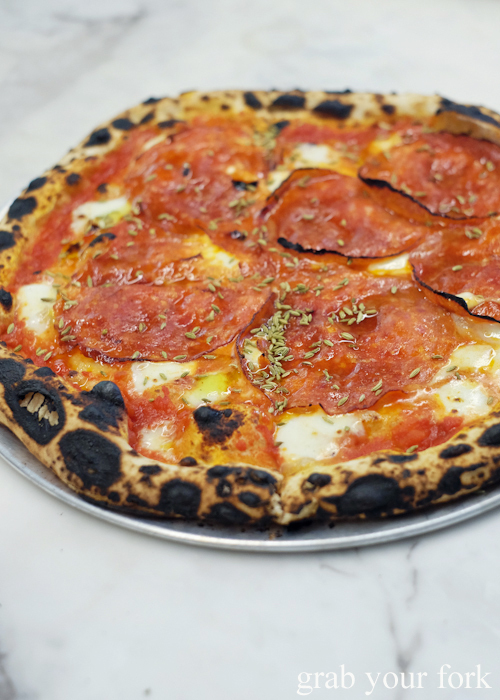 The housemade pepperoni is thinly sliced and almost crisp at the edges, sweet and smoky without any sense of greasiness. And while I can see the intent in the generous scattering of fennel seeds, the dry seeds tend to provide more crunch than intensity of flavour. Pockets of melting fior di latte accented with parmesan provide a oozing richness against the sweet tang of chunky pomodoro sauce (made from tinned San Marzano tomatoes). And while the pizzas have already gone up in price a dollar or two since they first opened two weeks ago, they've also managed to switch up the pizza toppings too. Gone is the cime di rapa I'd been keen to try, replaced by the equally enticing - and subsequently delicious - cavolo nero pizza. A mountain of young cavolo nero leaves ends up as a much smaller pile, toasted to a caramelly brown around the edges, and dotted with fermented chilli. It's worth smashing the confit garlic cloves on your plate and then spreading them across your pizza slice, before relishing your green veg uptake with a garlicky, cheesy and spicy grin. The dough itself? It's not quite as thin and floppy as a Neapolitan pizza but there's still a thinness to it that allows the toppings to take centre stage. 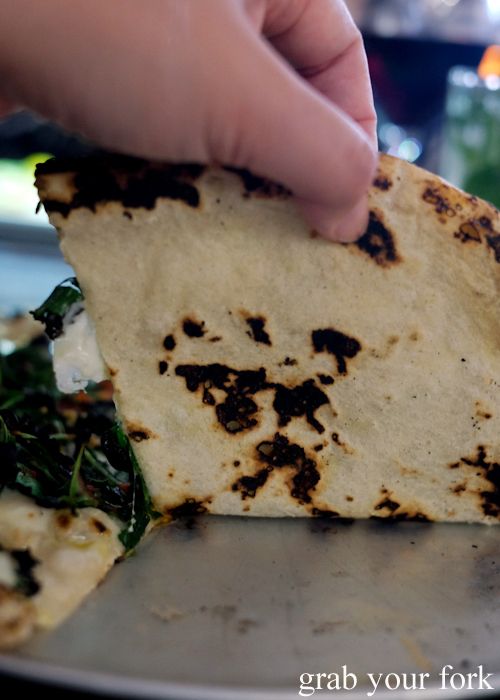 Giant blisters across the surface of the dough provide a puffy lightness, and while some may consider its char to be more on the burnt side of cooked, I would have been happy with even more smokiness. 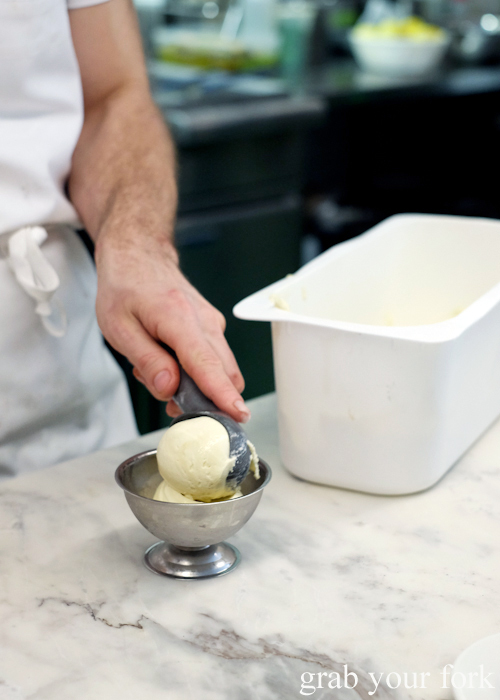 All the desserts are made inhouse, including a commendably smooth and fragrant fig leaf ice cream. 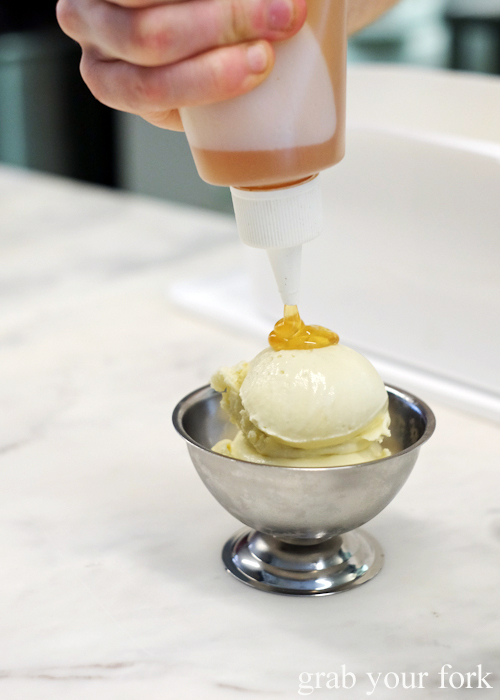 The fig leaf ice cream has all the flavour of fig, but pulled back on the jammy sweetness. It's so good on its own I don't think it even needs the drizzle of yellow box honey. The texture of the ice cream is incredible too, creamy with an enviable silkiness. Of course we had the tiramisu. It's not until it arrives that we learn the traditional savoiardi fingers have been switched with an almond cake layer that tastes like an almond dacquoise. 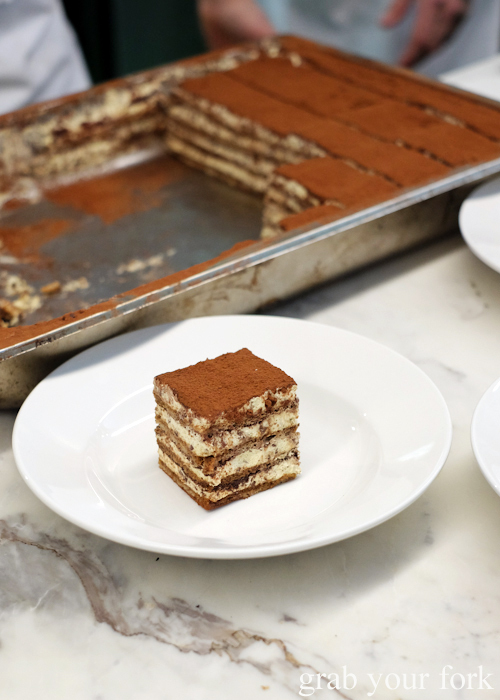 It makes for a more textural tiramisu, its signature softness interrupted by the crunch of almonds. For maximum fun. 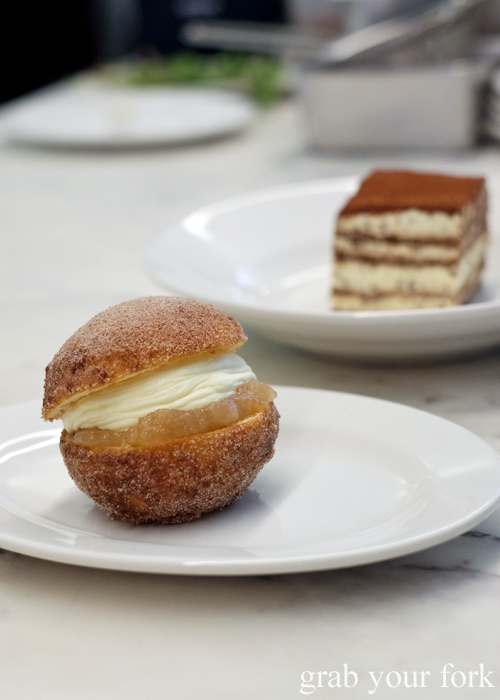 get the bombolone doughnuts, fried fresh to order and then stuffed with stewed apple and mascarpone. It's just like an apple turnover in doughnut form. The cinnamon sugar will go all over your lips and make a mess, but just like eating a bella brutta pizza, that's half the fun. I can see how I will have a hard time choosing; cavalo nero, clams or mortadella?! But I will definitely have the stewed apple doughnut! So many great up-close pizza-making (and dessert-making!) shots, Helen! I can feel the heat of the wood-fired oven on my face, from just seeing your brilliant photos. So glad you got to try so many things – including the bombolone (I gotta check that out next time and I still need to order the cannoli, too)! I hope the cime di rapa returns, the lemony greens were so delicious with the ricotta. But the marinara with cheese is probably my favourite. 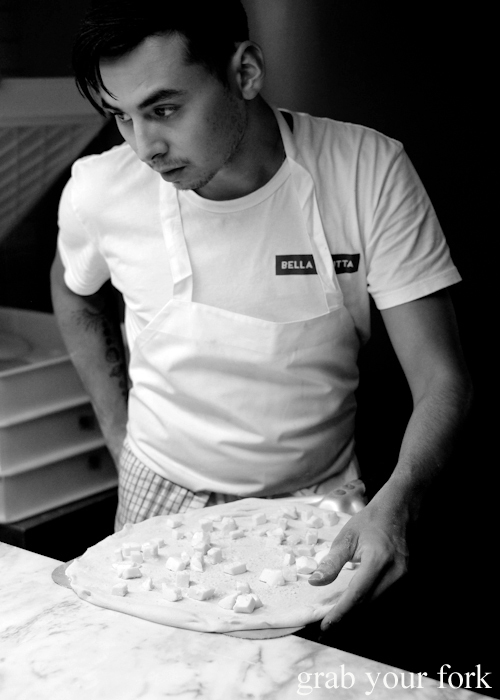 So glad you got to get your pizza fix at Bella Brutta! 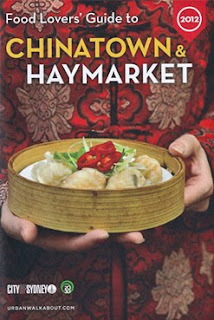 I need to go here ASAP! I don't know how I will choose though!! The pepperoni pizza has my name all over it! 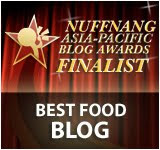 Food looks great! !